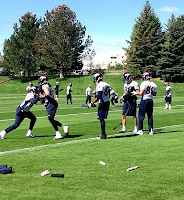 On Monday at Dove Valley, the Denver Broncos got back to work by kicking off organized team activities (OTAs). Among the notable players that did not show up for the voluntary workouts were running back Willis McGahee and left tackle Ryan Clady, according to multiple on-site reporters on Twitter. McGahee, of course, often skips OTAs to work out on his own—his agent, Chafie Fields, told the Denver Post's Mike Klis that McGahee is not trying to send a message. But even with the team working out on a "voluntary" basis, McGahee skipping does not help his chances of making the team. After drafting Montee Ball in the second round (58th overall) in April, the Broncos are primed to part ways with a few running backs this summer. As for Clady, he is still recovering from shoulder surgery at his own pace. He is also in the midst of a mini-contract dispute with the team. Denver placed a $9.6 million one-year franchise tag on Clady earlier in the offseason. But until Denver offers him a long-term deal, Clady doesn't figure to show up this offseason. Meanwhile, quarterback Peyton Manning answered every question in typical Peyton Manning form on Monday. "I feel fine," Manning said when asked about his health. When asked about the possibility of the team adding free-agent defensive back Charles Woodson, Manning added, "He'd be a great addition to our team." OTAs will run through Wednesday and pick up again next week and conclude in June.